The FairPay Zone: Consultant John Blossom: "Pay as You Exit: FairPay Explores New Content Pricing Discovery Regimes"
"FairPay's concept is fairly simple, but intriguingly powerful." That comes from a very nice overview of FairPay and its potential value by John Blossom, President of Shore Communications, an award-winniing strategy and marketing consultant to content providers, on his ContentBlogger blog. 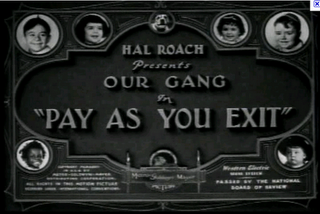 John begins with the amusing story of an early step toward FairPay in the classic "Our Gang" (aka "Little Rascals") film comedy episode titled "Pay As You Exit." John highlights the value of FairPay as a "pricing discovery" regime. "The key to all of this is the profile data, of course, which is where Reisman may have his finger on a very valuable idea. FairPay is in essence real-time market research tool, enabling media providers to get more sophisticated insights into real willingness to pay for specific content under specific circumstances." His conclusion: "While it's very early days for the FairPay model, it could turn out to be a tool that content producers could use to experiment with pricing in new and exciting ways that could lead to higher margins and deeper market penetration for their content - two concepts that could lead to more happy endings on their bottom lines." Of course these snippets do not do justice to John's well reasoned exposition (and his recounting of the Our Gang episode) -- Please read John's full post.